Melina Koan was born in Athens, Greece in 1987. As a young girl she started painting, not as a professional but for her own pleasure. From 2005 until 2010 she studied Building Restoration and Renovation in the city of Patras, Greece. After several years working as an architect her passion for drawing became stronger, leading her to the decision in 2016 that painting was her sole purpose. In February of 2018 inspired by pop art and street art she participated in "Miss Pepper" exhibition that took place at Michalis Kakogiannis institution. In May of the same year the artist started her first solo exhibition "The Missing Background" and took place at the Sofitel Athens Airport Hotel. By June she took part in a group exhibition held by the Skoufa Gallery at Mykonos island and in January of 2019 her paintings are displayed at the Electra Gallery. 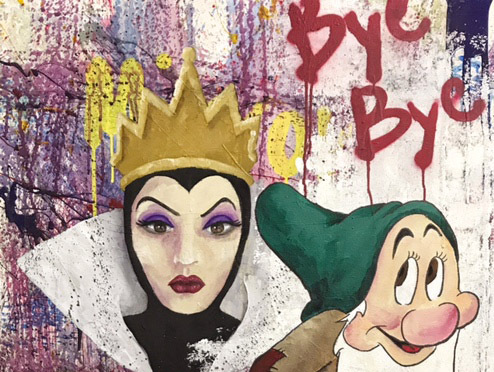 In February of 2019 her second solo exhibition "Once Upon a Time" takes place in Barrett. "Once Upon a Time" will be held at Barrett until the 6th of March and eight painting will be displayed. The intention of the artist is to remind us through her paintings that we all were once kids and had dreams... it is something that most of us forgot thought out the years and have lost our childhood superpowers.. a superpower uncovered in the exhibits, refers to the way we used to see the world back then as children. The exhibitions projects depict everyday moments in life through children's pure eyes. The question this exhibition is negotiating is 'Could we see the world with that innocent point of view as we used to do back in our childhood years, again right here right now, as adults?' If you feel the answer is Yes, then the interpretation of the stories displayed on the paintings can come true. That is the question the artist poses and you are invited to think of and give your own unique answer.